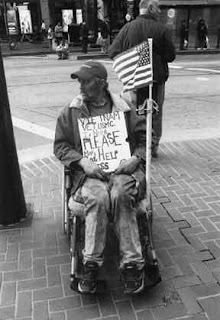 I was talking to a guy today, a vet in a wheelchair who has no place to live. He sells those tiny little flags and makes a little money, his wheelchair was laden with the flags and his belongings and I noticed one of his legs was a prosthetic although I'm pretty sure he still couldn't walk. He had all these bags tied to his chair which nearly doubled it's girth, some of the bags were taped and swollen and to be honest it was kind of a mess. I couldn't help but wonder what folks think when they come across him on the street, and if they knew how much it would mean to him if they bought one of his flags, how hard he tries to sell them and how little he actually makes. He told me business has been pretty slow lately and he's not sure why. I thought that if folks knew how hard he's trying then maybe they'd buy one, or if they saw where he had to sleep at night maybe they'd buy two. But I don't know if folks can tell those things when they see him on the street, his flags and his leg and his chair and his stuff, all of it together in human form, maybe the eyes block the heart, the mind plays it's games and we turn away because perhaps we don't feel all that patriotic or worse because we just don't know what else to do.